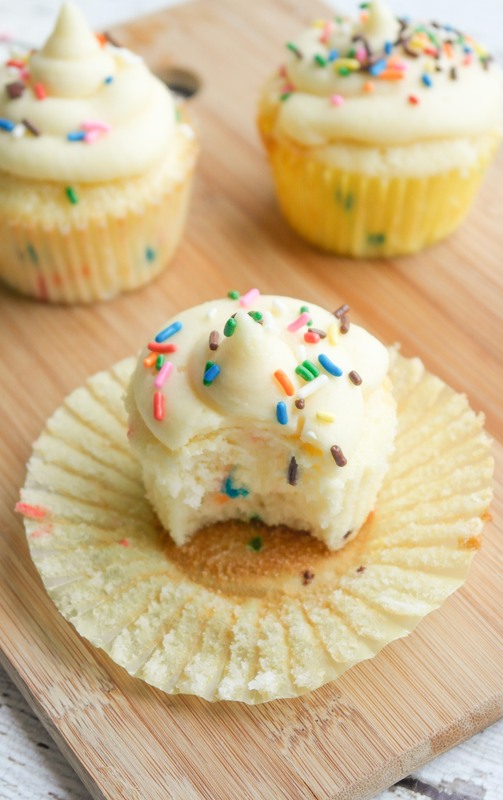 These funfetti cupcakes are fluffy, moist and sprinkle-filled. 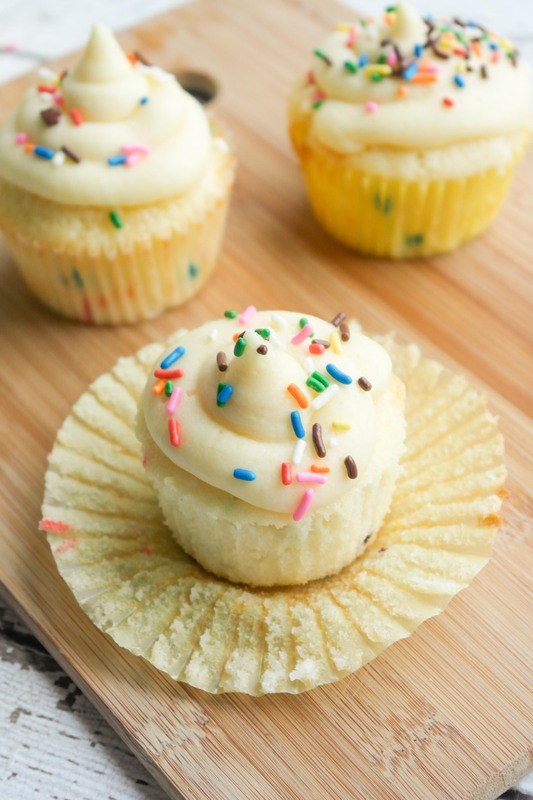 Add a thick layer of cake batter frosting and these are perfect for any celebration! I wanted my funfetti cupcakes to be extra fluffy, more fluffy than my best vanilla cupcake recipe, but still moist. I had a few science tricks up my sleeve, so I set about altering my cupcake recipe. The first thing I did was replace half of the butter with shortening. Why would I do this? Shortening is hydrogenated vegetable oil, which means it already has lots of bubbles pumped into it. Because baking powder can only work on pre-existing air bubbles, these additional bubbles in shortening will make the cupcakes extra fluffy. I kept half of the butter because shortening isn’t all that flavorful and I wanted a nice buttery taste. The second thing I did was replace two of the eggs with four egg whites. The egg to egg white conversion in cake is 1 egg is equivalent to 2 egg whites. I chose to use 4 egg whites instead of 2 eggs because many “white” cakes are made with just egg whites. Without egg yolks, the cake bakes up whiter and less dense, because egg yolks impart moisture and a yellow-tint into the cake. That’s why I only replaced half of the eggs with egg whites: I wanted the cake to still be a little yellow and I wanted the extra moisture. Finally, I used the classic creaming method rather than the reverse creaming method. The classic creaming method creates a fluffier cupcake with greater height due to the first step of the process: you cream together the butter, shortening and sugar to whip air into the mixture. The more air bubbles there are, the fluffier the cake will be because baking powder has more air bubbles to act on. The reverse creaming method, while it is my preferred method, makes denser cupcakes and a funfetti cupcake simply cannot be dense! With these little changes, I made the funfetti cupcakes. They turned out exactly as I wanted them to. They were fluffy, yet moist, and filled with lots of sprinkles. The real kicker? I added a thick layer of cake batter frosting. The cupcakes themselves aren’t overly sweet, but that is completely offset by the over-the-top-sweet cake batter frosting. Set out the butter for at least fifteen to thirty minutes before baking. It’s much easier to work with softened butter and it incorporates better. Set out the eggs so they can come to room temperature and then mix them in one at time. Similar to butter, they will incorporate better if you follow those steps. Finally, set out the whole milk before you add it to the mixture. Similarly, it will incorporate more evenly. Cream together the butter, shortening and sugars for 5 minutes, put it back in the fridge for 5 minutes, then cream for 5 more minutes. Why do this? 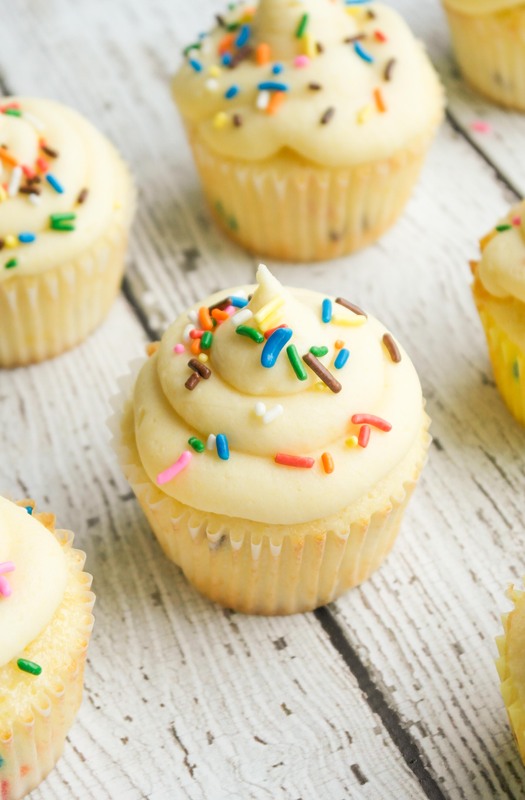 You want to whip in as much air as possible for fluffy cupcakes, but whipping the mixture creates friction and can break down the bonds of the butter. If you refrigerate it for five minutes, this prevents the butter from getting too warm and breaking down. Be careful not to over mix! Once you’ve added the last bit of flour, only mix until the flour is fully incorporated. Otherwise your cupcakes will be tough and funfetti cupcakes are supposed to be delicate! 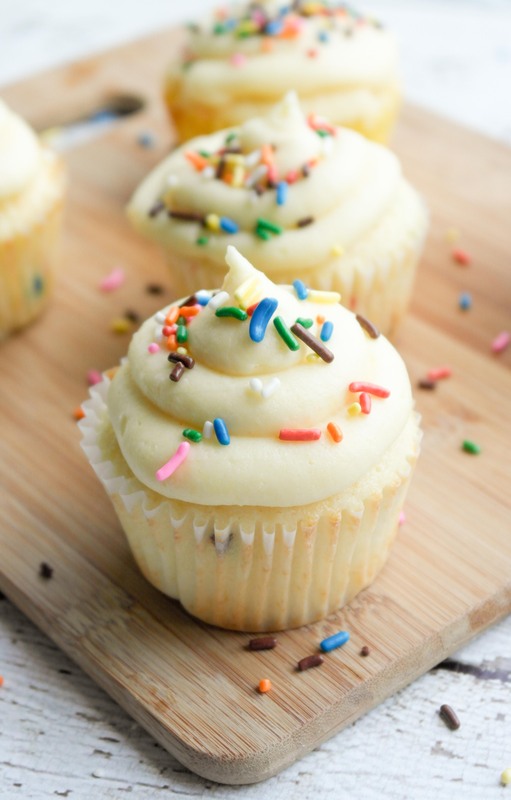 These funfetti cupcakes are fluffy, delicious and sprinkle-filled. 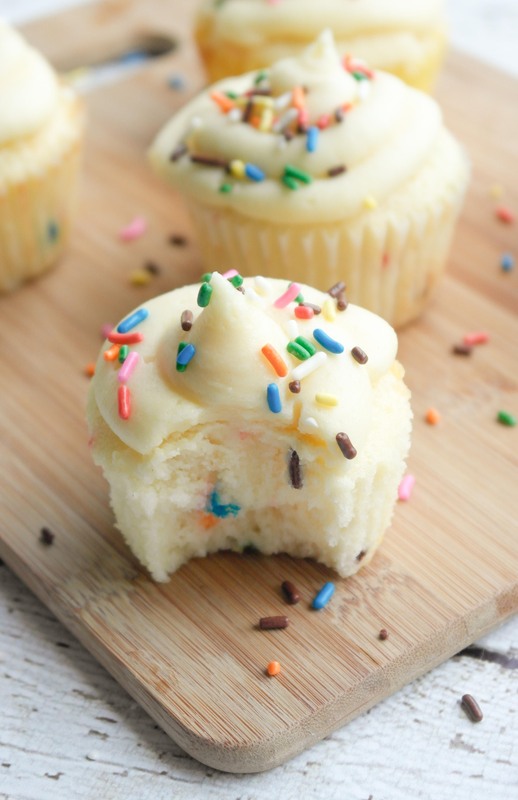 Add a thick layer of cake batter frosting and these are perfect for any celebration! Set out the butter for fifteen to thirty minutes. Measure out the whole milk and set it out as well. Preheat the oven to 350 degrees. Line cupcake pan with cupcake liners. In a bowl, cream together the butter, shortening and granulated sugar. Cream for 5 minutes. Return to the fridge for 5 minutes. Then, cream for a final 5 minutes. Add each egg individually. Then add the egg whites. In a separate bowl, sift together the cake flour, baking powder and salt. Beginning and ending with the flour, alternate mixing in the flour mixture and milk. Put about a fourth cup of batter into each cupcake liner. Bake for 11-15 minutes or when a toothpick comes out clean. Cream together the butter and yellow cake mix. Add the powdered sugar gradually. Then cream in the milk. Add more powdered sugar or more milk depending on the desired consistency. seriously how do you get your cupcakes to look so perfect! i am definitely craving a bite, they look so fluffy and delicious.. loving all the funfetti sprinkle action going on too! How much of the sprinkles did you use?? Hi Lisa! The mixture of shortening and butter really helps reduce the yellow-ness. That being said, if you’d like it to be super, super white, you can replace the butter-shortening mixture with all shortening. Eggs add yellow-ness as well, so you can remove the whole eggs and replace it with 4 egg whites (so 8 egg whites total). I hope that helps! do we beat the egg whites until light until stiff peaks and fold in or just mix in, and can i also use this as a cake or would you just recommend as cupcakes. Hi Lisa! You don’t need to beat the egg whites for this recipe. However, you certainly can! What I would recommend doing is whipping the egg whites to stiff peaks and folding them in last, right before you put them into the cupcake tins. This recipe would also work great as a cake! Depending on the size of the pan you use (9-inch or sheet pan), you’ll want to adjust baking times.